Another round of confrontation between the judiciary and the executive on the controversial issue of closure of commercial establishments in the Capital's residential areas looked imminent with the residents today challenging in the Supreme Court Centre's new ordinance putting a ban on the sealing drive for a year. 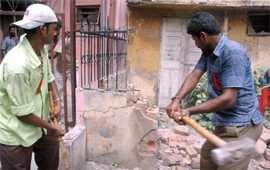 A Tribune file photo of MCD employees demolishing illegal construction at Patel Nagar in the Capital. The CPM's Delhi state committee held a procession demanding the scrapping of the Indo-US nuclear deal today. The Sector-39 police and SOG have arrested three dreaded criminals after encounter near Sadarpur village on September 17. Sushil, alias Ghoda, of Salempur district, Bulandshahr, was a proclaimed offender. Besides, Vipin Jat of Dangra Jat, Jahingirabad police station area, Bulandshahr and Pawan, son of Santosh Pal of Murad Nagar, Ghaziabad, were a big catch, SSP A. Satish Ganesh said today. The Greater Noida Authority has warned 3000 allottees to get their properties registered by 30 September this year otherwise they will be slapped with threefold penalty. All the allottees of plots and houses in Greater Noida Authority must get their properties registered by the end of this month. The BJP has demanded an enquiry into the alleged corruption in the Yamuna cleaning project. Speaking in the Legislative Assembly Harsh Vardhan thanked Lieutenant Governor Tejender Khanna for constituting a committee to ascertain the public opinion on cleaning the river. The construction of Games village along the Yamuna bank has been undertaken against the advice of experts, said Manoj Kumar Mishra of Yamuna Jiye Abhiyan on the concluding day of a seminar on the 'State of India Rivers' here today. The Supreme Court today came down heavily on the Centre for failing to take firm action against politicians and public servants unauthorisedly occupying government accommodation in the country. A bench of justices B N Aggarwal and D K Jain commented that the government lacked the will and guts to take action against influential persons since it involved vote bank politics. At least 70 per cent of Conditional Access System (CAS) subscribers are not satisfied with the service provided, according to a study conducted by a Delhi-based NGO. Patrick Goni Diaz has been cycling around the world since February 2006. Patrick started his journey from Spain. As part of his tour, he was in the Capital yesterday. Patrick Goni Diaz who is cycling around the world for fostering integration in the Capital on Tuesday. One out of every five children who dies of diarrhoea in the world is an Indian. Responding to the sting operation conducted by a citizen Chetan Prakash, Delhi Police have suspended 25 policemen. Chetan had photographed 14 policemen accepting bribes from different people. The rest of the policemen were just visible in the background of the footage. The police authorities have informed the High Court about the decision. The police has arrested four accused and three receivers of stolen property, involved in a case of dacoity and murder. On September 11, some persons entered a factory and threatened workers to stop working. Subsequently, they loaded the finished aluminium goods in rickshaws. They fled, after stabbing Nagender, a guard. Nagender succumbed to the injuries. The National Capital Territory of Delhi Laws (Special Provisions) Second Ordinance, 2007, promulgated on September 15, has put a break on sealing operation going on under the direct supervision of the Supreme Court appointed Monitoring Committee. 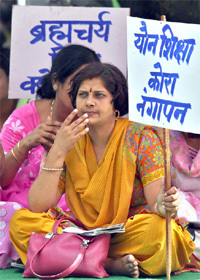 The ordinance was sought to be struck down by the Delhi Pradesh Citizens Council (DPCC), a welfare association of residents on whose petition the apex court had intensified the sealing drive even after the Centre passing the Delhi Laws (Special Provisions) Act in December 2006 putting a year's moratorium on it. While the Supreme Court is yet to give its ruling on the validity of the 2006 Act, the Centre came up with the new ordinance to put a ban on the sealing drive, a petition moved by DPCC counsel Jasbir Malik said. As an interim measure till the validity of the 2006 Act and the new ordinance was decided, the DPCC has sought an interim stay on the promulgation. Laying down 11-point legal grounds for challenging the ordinance, the DPCC said it ran contrary even to the Delhi Master Plan, 2021 declared by the Centre last year amidst the ongoing litigation on the issue. "The ordinance also violates the undertaking given by the Centre to the court that the authorities would undertake the sealing exercise in respect of all areas which are not covered under the Master Plan, 2021," the petition said. When the court was already seized of the matter, the government should have taken "prior approval of the apex court" to issue the ordinance, the DPCC said. The ordinance did not take care of the concerns of the residents and its provisions could not be considered to be in public interest, rather it encouraged illegal commercial activities in residential areas by those who had indulged in it earlier. The government had once again attempted to "unsettle" the position of law on the sealing issue and even the constructions made after January 1, 2006, which were to be stopped as per the provision of the earlier Act seemed to be approved by the ordinance, the DPCC claimed. This virtually would put the clock back to square one and the government was not expected to protect those who had violated the law as the duty of the executive was to enforce the law and the verdicts of the court. "But unfortunately under Section 3 of the ordinance, the violators of the laws have altogether been saved from sealing despite the court order," the petition said questioning the competence of the government to promulgate it when the matter was sub judice. More than 3,000 people participated in the rally. They marched from Mandi House to Parliament Street. CPM general secretary Prakash Karat along with central committee members Subhasini Ali and Jogendra Sharma and secretary of Delhi state CPM Pushpinder Grewal addressed the rally. Sharma attacked the leadership of the Congress party for spreading rumours against the Left on the Indo-US nuclear deal. He alleged that the Congress had accused the Left of not understanding the coalition politics. He said that the Left had been supporting the government on the basis of the common minimum programme (CMP). Since the inception of the UPA government, the Left has opposed every anti-people policy pursued by the government. The Indo-US nuclear deal compromises "our sovereignty and is unacceptable to the Left," said Sharma. Subhasini Ali alleged that media was manufacturing an opinion that the nuclear deal was not an issue for the common man. She said that it was the common people, who had laid down their lives to free the country. They would not tolerate any erosion in "our independence and sovereignty in the 60th year of independence, 150th year of the revolt of 1857 and the 100th birth anniversary of Bhagat Singh." The government had scuttled the Indo-Iran gas pipeline to please the US, said she. Iran would continue the project with Pakistan, since the Indian government had not responded to the proposal. Prakash Karat held that the nuclear deal should not be seen in isolation, but as part of a large strategic alliance that the government wanted to forge with the USA. As a consequence of this alliance, MNCs like Walmart would come to the Indian market, leading to large-scale unemployment among small retailers. The Congress does not enjoy a majority in the Parliament on the nuclear deal issue. Karat said that in a democratic country like India, any issue that did not enjoy a majority in the Parliament could not be implemented. Pushpinder Grewal attacked the attempts of the government and its loyal scribes to present the USA as a peace loving and democratic power. He reminded of the US imperialism in Korea, Vietnam, Congo, Chile, Iraq, etc. He asserted that people would never accept a subordinate relationship with an aggressive and oppressive power as the US imperialism. The members of the gang were wanted in 50 cases. They were active in UP, Haryana and Delhi, the SSP said. He said about one and a half months ago, a Santro car was stolen from Birla Soft Company, Sector-63 Noida under Sector-58 police station area. Its driver was dumped in Bisarakh jungles by the carjackers. A fortnight ago, a red colour Bajaj motorcycle and a cell phone were looted from Sector 22/12 at 10 am and about two months ago a bike was looted at the point of gun under Sector-58 police station area. The vehicle was later sold to one Satvir, resident of Sarai Ghasi, Bulandshahr for Rs 5,000 There were half a dozen more recent crimes committed by this gang. The kingpin of the gang, Ajay Janto, a dreaded criminal who has since been killed, used to operate with the help of a woman accomplice, Renu. She would wave the cars with a lone driver for lift at night. Then the driver would be killed and car looted. Some more shocking facts have come to our notice, but it would not be proper to share them with the media right now as it could have adverse effect on the ongoing investigation, the SSP added. The gang used to operate according to a shrewd strategy and there was a peculiar pattern in the incidents of autolifting in NCR. The owners somehow get compensation from the insurance companies, but ultimately it would tantamount to national loss of the magnitute of Rs 22,000 crore in NCR alone. The SSP said the situation in Noida was however much better than adjoining districts of NCR. A special camp is being organized at GNIDA office on September 20 and 21 for those who want to avail the opportunity to get their properties registered. The district administration has lost Rs100 crore because of allottees failing to get their properties registered on time. In case of failure to get their properties registered by 30th of this month, allottees will have to pay a penalty three times apart from the stamp duty as determined by the district administration. Allottees are normally allowed three to four years time to get their properties registered. Those who do not get their properties registered choose to pay penalties and get the dates extended every year. Whenever allottees get their properties registered, they have to pay the stamp duty prevalent at the time of allotment. Now 3000 allottees have been identified by the Authority, who have failed to get their properties registered. They have been given time up to September 30. Failing which all of them have to get the registries done at the rates decided by the administration. Notices are also being sent to the secretaries of housing societies whose members are also defaulters. Holding the Delhi and Central governments responsible for the pathetic state of the river, Harsh Vardhan said that two schemes had been completed in the name of cleaning the Yamuna. More than Rs 1,800 crore have been spent to complete the project. The Yamuna has not been cleaned so far because the intentions of the Central and Delhi governments were not clear. Chief Minister Sheila Dikshit had filed an affidavit in the court that both the banks of the river should be free from pollutants and the cleaning campaign will be initiated in a proper way. On the pretext of the affidavit she demolished many ancient temples on the riverbank. Lakhs of J.J. dwellers were deprived of their homes. Now the Chief Minister wanted to sell that area on the banks of Yamuna to the Mall lobby, he alleged. The Commonwealth games were only an excuse. The Delhi Government has prepared a scheme to change the riverbanks into a concrete jungle. Plans have been prepared to develop multi-storeyed residences, malls, shopping complexes, catering areas, entertainment sites, Metro depots and helipads. The views of the environmental experts and hydrologists were being disregarded. Just after the completion of games all the constructions made under it will be handed over to the private builders and mall mafia after taking heavy bribes. 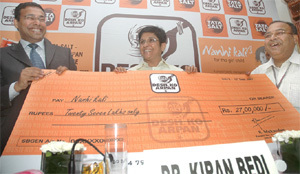 Dr Harsh Vardhan told that the Congress, which claims to be sympathiser of the poor, has become completely anti poor. It sympathises only with the rich builders and Mall lobby. Length of the Yamuna flowing through Delhi is 45 kms. At the time of entering into Delhi it is completely clean. But it gets polluted while flowing through Delhi. ''In fact, the Games village is a big scam for minting money. Games are just an excuse. After the event, the flats constructed there will be sold to private owners, bringing in crores of money to the DDA and the contractors," he said. He added that it was unfortunate that the DDA refused to see the three large land acquiring agencies were along the banks of the Yamuna. What will you do with political parties and other big people. You don't have guts because it concerns your vote bank. You hang the peon and leave the big people, the apex court observed, while dealing with the issue of unauthorised occupation of government accommodation. Voluntary Organisation in Interest of Consumers Education (VOICE) profiled as many as 1,000 cable television service subscribers in South Delhi. VOICE, which will present its report to the ministry of information and broadcasting, has recommended that the government should consider holding back CAS till anomalies within the system are resolved. "The government may have to consider holding back CAS till policy makers figure out how to ensure proper monitoring, which impacts billing, reception quality and so on," Bejon Misra, executive director VOICE, said at a press conference here on Tuesday. According to the report, more than 53 per cent subscribers felt their monthly cable television bill has increased, while 40 per cent of the subscribers are not satisfied with the reception quality. Defective set top boxes and ineffective complaint redress system have also added to their woes. "Complaint redressal and access to the Multi-System Operators (MSOs), which supply feed -to- cable operators, are some other issues that are yet to be addressed by the government regulatory authority," added Misra. The findings of the study also reveal that CAS does not cover 35 per cent of subscribers in South Delhi. This creates a huge loss for the government as well as the broadcasting industry through tax evasion. "I have been cycling since I was five, but it was at 31 that I decided to take my hobby seriously," said Patrick and added, "I wanted to spread the message of integration and humanity and cycling gives an additional meaning to it." India is the 21st country that he has visited. Patrick started an NGO named 'Humanists without Frontiers' in Barcelona with his 12 friends. Its website is www.imagineonbike.com. However, he was the one, who took it beyond the cultural and geographical boundaries. Being a student of Orientalism and Buddhism, India was one of the countries that he wanted to visit. He went first to Dharamshala and then visited the Capital. "My friends asked me to avoid visiting the Middle East, as it was not safe. But I went there and found it very friendly and pleasant," he said. "During the day I cycle through the countries and as night falls, I go off to sleep," he said. The only problem that he faces almost every night is that of dogs. Dogs of all countries bother him when they find him dozing off on streets. Today, he started his journey for Nepal through Uttar Pradesh. He has numerous stories to tell and experiences to share. Patrick's journey would end with an exhibition in Spain in June 2008. Minister of rural development Raghuvansh Prasad Singh said that every day around 1,000 children died of diarrhoea in India, which meant 41 children, lost their lives every 60 minutes. He was speaking at the second International Learning Exchange (ILE) programme on water, sanitation and hygiene here today. "Globally, some 1.8 million children die each year due to diarrhoea, which means 4,900 deaths every day. Around 1,000 children die every day in India," Singh said.Quoting a United Nations Children's Fund (UNICEF) report on the disease, Singh said, "Deaths from diarrhoea in 2004 was almost six times greater than the average annual deaths in armed conflicts worldwide." When questioned about the outbreak of cholera in Orissa, in which over 150 people lost their lives, the minister informed, "We have sent a central team to assess the situation and their report will be assessed thoroughly." However, he claimed that the total sanitation campaign of his ministry had yielded desired results in the last three years. "90 per cent of our population has access to safe drinking water and 49 per cent has access to toilets. We hope that India will achieve the millennium development goal in the field of sanitation before 2015," Singh said. "In 1981, only one per cent of our population had access to toilets, and the percentage rose to 22 in 2001. Currently, 49 per cent of our population is using toilets and it is a move in the direction of better sanitation," he added. The cop had stopped the bandit from carrying a bundle of bidis to Dasna Jail from the court complex after a hearing. Late at night a report was registered in the case. Noman of Bulandshahr, wanted in over a dozen cases, was brought from Dasna Jail to a Phase-II court for a hearing on Monday. The cops found a bundle of bidis in his possession when he was frisked before boarding the police van. When asked to give up the contraband, he turned violent. On being informed SO, Phase-II police station, reached the court complex. SO had informed the senior officers. Later on SSP's order, Phase-II police registered a case against the bandit for manhandling the cops. After receiving an information, the police conducted a raid in Daya Basti. Fiaz Ahmad and Raj Kumar were arrested. Their other associates were later arrested on their instance. The police also followed the receivers of the stolen property and nabbed three accused. With the arrest of Sandeep, Rishi and Pradeep, the police claimed to have solved a kidnapping and murder case of Arjun Rajak. It was reported on September 3 that Arjun Rajak, a driver, had gone missing with the car, since the time he had left Gurgaon to drop someone at Dilshad Garden. The missing car was intercepted at the Lakshman Jhula in Uttaranchal. A team was dispatched to nab the driver of the car. Sandeep was arrested from the given place. It was found that Sandeep and three of his associates took lift from Arjun and, subsequently, robbed him. He was then murdered and thrown in drain no 8 of Gohana, Rohtak. One Tata Indica was recovered from the accused. The police arrested two alleged debit card thieves, Prabhakar and Kuldeep. On September 3, a complaint was registered by Gopi Nath that his debit card had got stuck in the ATM machine at the Kasturba Gandhi Marg. It was also found that someone had swiped the card for Rs 50,000. The bank statements of the card revealed that it was swiped at two petrol pumps. The registration numbers of the bikes were taken from the petrol pumps and two persons were interrogated in this regard. The accused persons confessed of their involvement in the crime. According to the police, the accused watched the complainant use his ATM card and when it got stuck inside the machine, they pulled it out with the help of an iron needle. After that, they used the ATM extensively. Efforts are being made to recover the items purchased by the suspects. The police busted a network of drug traffickers in Nand Nagri. One Om Prakash was arrested after a raid, but the other accused, Bijender managed to escape. The police received information yesterday about two persons engaged in drug trafficking in Nand Nagri. A decoy customer was sent to the area and a deal clinched. After getting an indication from the decoy customer, one of the accused was apprehended. While, the other managed to escape. Around 300 gms of smack worth Rs 30 lakh on the international market was seized from them. Later, it was found that smack was being brought in the city from Mohali. One Manjeet involved in the kidnapping of a businessman from the ITO was arrested today. According to the police, Manjeet along with his associates Gola and Swamy abducted Nitin Wadhwan. Wadhwan allegedly had assaulted his brother a few days ago. The three had abducted Nitin from his garage near Bal Bhawan at the ITO last evening. They allegedly took him to Sarai Rohilla, assaulted him and threw him on the pavement, before decamping with the valuables. The PCR personnel took him to the LNJP hospital.